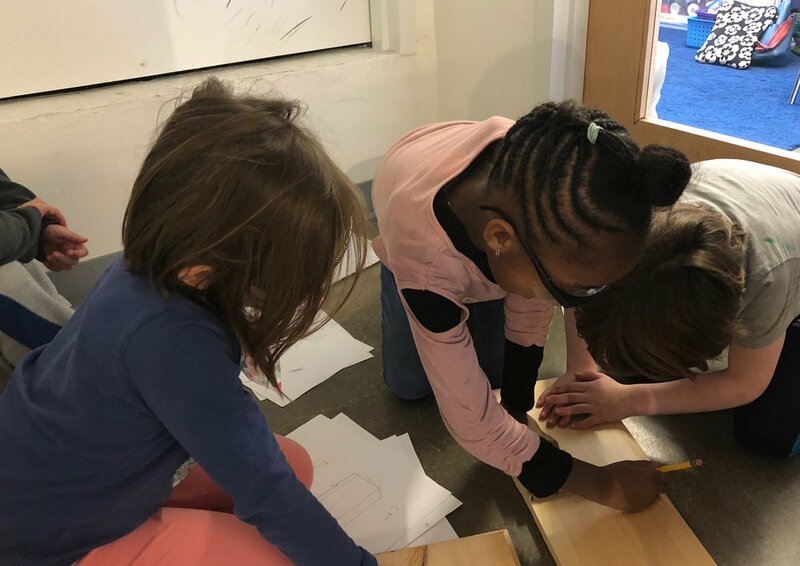 First graders are very busy right now with a project that combines their mathematics and science curricula with hands-on experience: building window boxes. Working together in groups of three or four, students measure their classroom's windowsills and then draw a blueprint for window boxes with measurements included. After creating their blueprints, students begin to construct the boxes themselves. "The project is an extension of our measurement unit in first grade," said first grade teacher Melissa Burns. "Our curriculum has first graders learning to measure with nonstandard units, but Bob is extending it to inches and feet and really building something." Working with Bob Dowling, the other first grade teacher, students measure, mark, saw, and assemble the window boxes before decorating them. The class will make four boxes in total–two will remain in the class, and two will be filled with wildflowers and sold at the Atrium Auction. The project gives students a practical application of measurement, as well as a 3D perspective of their measurements and blueprints. Students get the opportunity to collaborate by working together to help each other measure and construct the boxes. 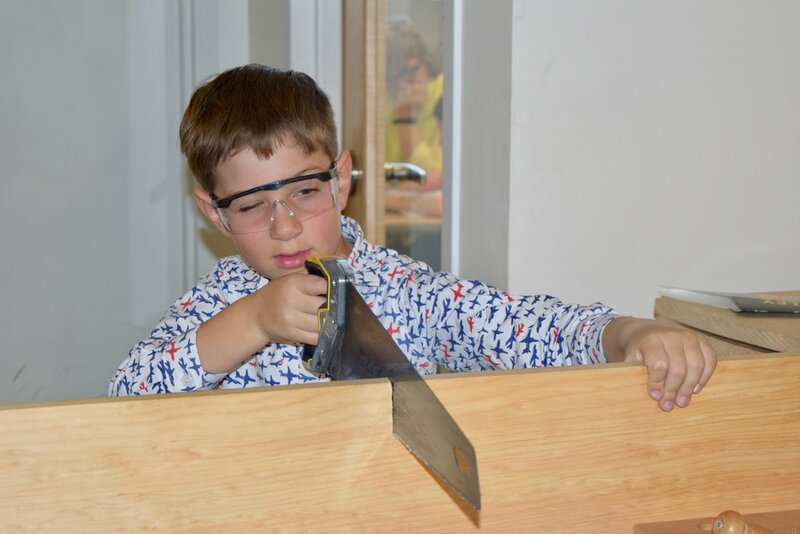 The project also allows them a sense of responsibility and great pride at making something themselves, while improving their motor skills as they practice their construction skills with full-size tools (and safety goggles). The first graders are unanimous: sawing is the best part of the project. Noor added, "It's better than just drawing blueprints because you can really feel how the projects are going. You can get to understand what you're doing so you can do it when you're grown up. It's really good to do things when you're little, so when you're grown up you can do it all on your own." After the boxes are assembled and decorated, they will be filled with soil and seeds, another element of the first grade curriculum. As they learn about seeds and plants, they will also be able to measure changing elements, instead of static parts. "This ties into the first grade science curriculum, which includes recognizing, representing, and labeling the parts of seeds and plants," Melissa said. "After we plant from seeds in the boxes, we will transplant some of what we grow to the beds outside."